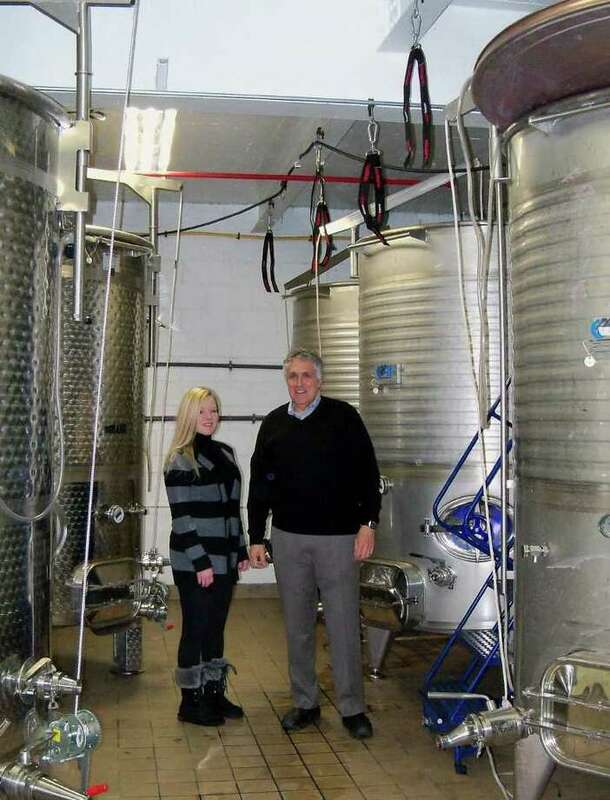 Jessica Beale, left, and Tony Izzo stand amid the large vats used to make wine for Black Rock Vintners, a winery in Bridgeport's Black Rock section owned by Izzo, a Fairfield resident. It might not be your typical location for a winery -- tucked away on Burr Court off Fairfield Avenue in Bridgeport's Black Rock section, sharing space behind a tank removal firm. But Black Rock Vintners, the atypical winery, has been producing award-winning wines. Owner and Fairfield resident Tony Izzo grew up with uncles who made their own wine, a tradition that he continued with a group of friends. "I did it with a bunch of friends in the basement," Izzo said. "I wanted to learn a custom that I had grown up with." At first, he just provided the wines to his family and friends, but when the demand for the wines grew, Izzo's hobby transitioned to a full-fledged operation in 2003. "We made our first wine in 2004 -- a Cabernet -- and began selling it in 2006," Izzo said. "We started making more wines in 06, 07 and 08 and began a stable selling effort with liquor stores and restaurants." In Fairfield, restaurants like Centro and Osiana Mediterranean serve Izzo's wines, and you can pick up a bottle at a host of local liquor stores. After they try the wine, people are often shocked at how good it is, said Jessica Beal, who handles public relations for Black Rock Vintners. The grapes used come from California and South America. "I think people think of Connecticut wines one way, but then they have a taste," Izzo said. "We're really selling a quality product." In fact, Black Rock's 2005 Cabernet Sauvignon using grapes from the Alexander Valley, has won one gold, three silver and one bronze award, while another Cabernet Sauvignon in 2008 that uses a blend of Petite Sirah and Alexander Valley has won a silver and bronze award. Black Rock crushes its red grapes on site -- using a machine, not feet -- and buys white wine grapes already crushed. A white wine made in September or October can come to the market about six or seven months later, Izzo said, while for a red wine the time is closer to 18 months before it can be sold. "A 2010 red will probably go to market in 2012," he said. While the wines are made in large silver vats and then aged in oak barrels on the lower level, they are bottled upstairs. Cartons of different wines sit on pallets, waiting to be shipped out to individual customers, liquor stores and restaurants. "We try to produce quantities that we know we can sell in a certain period of time," Izzo said. The whites retail for $15 and the reds go for $18 to $25 depending on the type. Working for Izzo, both at his commercial real estate company and the winery, has opened Beal up to enjoying the beverage. "Before, I just thought I didn't like wine," she said. "Now, I know what wines I do like and don't like."